Learn how to cook pumpkin seeds without a hassle. Pumpkins can serve as more than just jack o’lantern ornaments to place on your porch. In reality, the whole pumpkin can be used whether it’s to help bake a pie, use the stem to hang things or use the remainder of it as compost. The best part of the pumpkin though has to be the seeds. They’re natural powerhouses, containing things like phosphorus, magnesium, manganese, copper, zinc, iron and protein, which are all great for your body. You can’t just eat them raw, so what you can easily do is bake them with a bit of salt, pepper and other spices to make a great tasting and healthy snack. 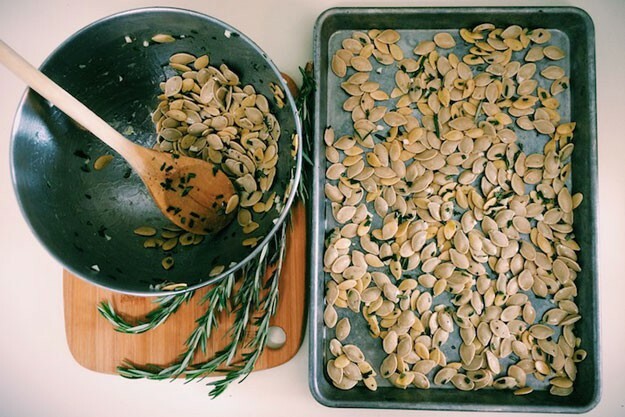 Check out the steps below to learn how to cook pumpkin seeds! Start off by cleaning your pumpkin seeds. While there are several methods to go about this, the easiest way would be to dump the seeds (along with the guts) into a large bowl and pick out as much of the guts with your fingers. Now, fill the bowl with cold water and massage the guts. This will make all of the seeds float to the top, making them easy to remove. Depending on how many seeds you have, dump out 2 cups of water into a pot for every 1/2 cup of seeds you have. Bring the water to a boil then dump in all your seeds, add a little bit of salt and let it simmer for around 10 minutes. Next, toss all your seeds into a bowl and add olive oil and any spices you would like, such as salt, pepper, garlic and paprika. If you’re feeling a little bit adventurous you can add honey, which gives it a bit of a sweet taste and compliments the other flavors well. Once they’re prepared, spread them evenly across a baking sheet. Preheat your oven to 400 degrees F and bake the seeds on the top rack until they are golden-brown, which usually takes about 15-20 minutes. Let them cool and you’re done! Also make sure to check out the video below, where you can learn how to use your entire pumpkin (not just the seeds).